Suva is the caipital an lairgest ceety o Fiji. It is locatit on the sootheast coast o the island o Viti Levu, in the Central Diveesion, Rewa Province. 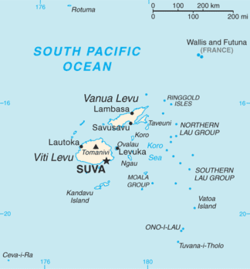 In 1877, it wis decidit tae mak Suva the caipital o Fiji when the geography o umwhile main European dounset at Levuka on the island o Ovalau pruivit too restrictive. The admeenistration o the colony wis muivit frae Levuka tae Suva in 1882. Suva is Fiji's poleetical an admeenistrative caipital. It is the lairgest an the maist sophisticatit ceety in the Sooth Paceefic (excludin New Zealand) an haes become an important regional centre; students frae the Paceefic region an a growin expatriate commonty mak up a significant portion o the ceety's population. Wikimedia Commons haes media relatit tae Suva. This page wis last eeditit on 10 Mairch 2018, at 22:15.